Road racing attracts a certain sort of person. You need to be determined, tough and have no fear of training hard, really hard. A high threshold of pain also helps as does the ability to listen to advice. Lance Armstrong calls cycling a “Lifestyle choice”. You can’t compare it to other team sports where you can be helped by a team mate “carrier” if you aren’t at full fitness, substituted at half time. Any weakness in a rider’s armour is quickly exposed on the road and exploited by rivals. Racing demands that you live and breathe cycling. Diet, rest, recovery and preparation are more important than other sports because of the difficulties of competition, equipment and clothing. Gears and tyres must be taken into consideration, not to mention tactics, the course, and weather and team mates. With all these difficulties, and the effort needed to compete, let alone be successful, why do we do it? Because it is class, a truly great experience. 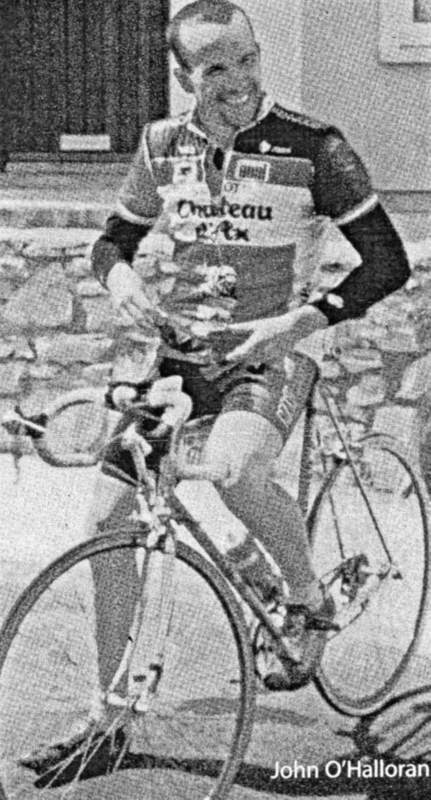 When you ride along at thirty miles per hour in a bunch of one hundred and eighty cyclists through glorious countryside, you feel strong, in control and feeling no pain, with lots of energy, waiting, calmly, for your chance to attack, to explode in one great effort to escape from your rivals and race to success. The Canadian cyclist Alex Scieda called this feeling 99% man. 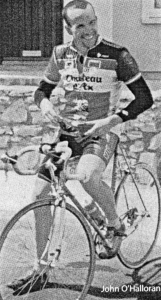 Stieda, the first Canadian to wear the yellow jersey in the Tour de France explained it thus: “For 99% of my races I was suffering, but that 1% of the time, when you felt so good and could beat the best in the world makes the 99% of suffering worthwhile”. This roller coaster of an experience happened to me in 1992. I was nineteen and riding in the FBD Milk Rás for the first time. The race began with me finishing strong on the first stage and a team mate coming second. Cocky and naïve I thought “This is going to be a piece of cake”. The next day the race taught me the most painful lesson I ever learnt on a bike. As we lined up for the start of Stage Two from Carrick on Shannon to Oughterard, the Mayor of the town wished us well and flagged us of. We hadn’t gone five miles out the road when dark clouds opened and the rain poured down. It lashed down on us. As the rain belted and bounced off the road, the race got harder as the Italian team attracted one after another at the front of the race. The riders became strung out in one line each one desperately trying to hold on to wheel ahead, and as this long line of colour and chrome wove its way like a snake through gale and rain the race got faster and harder. Finally the chains breaks and a small group escaped and establish a solid lead. To my delight one of my team mates was with them which meant we had a man up the road and no obligation to chase. Can you imagine a level of pain that is really intense but bearable? If you can, then you get a rough idea of the effort needed to stay in the bunch on a tough stage of the Rás. Constant, uncomfortable pain in your legs and lungs, cold wet air burns your lungs and airways, grit and dirt flies from tyres and gets in your eyes, nose and mouth, your head hurts because you are concentrating on the riders around you and not falling or crashing. You can go a long way on a good head and bad legs, but nowhere on sad morale and good legs, or so the old cycling saying goes, but when you are hurting so much after only one hour and there are over one hundred miles of hell to go, you really start to question your sanity. The demons start to creep over your shoulder and doubts start to set in your head, at least they don’t stay there too long because your brain is already full of rainwater and dirt. A slight rest or a small tailwind gives you enough morale to keep going. The highlight of your day is a piece of fruit cake from your back packer, but even that can’t cheer you up that much. After seventy miles, the constant heavy rain turns to sleet and snow and you swing into the teeth of the weather you lose the last of the feeling in your hands, feet and ankles which is great, because at least it matches the intense pain in your arms and legs. Around this point it’s all or nothing to survive let alone do well; I drifted back to the team car, grabbed on to the window with my hand and mumbled and stuttered for the mechanic to get me my race bag which contains all the stuff you need for after the race; warm dry clothes, food, gloves, etc. I managed to get a pair of gloves and a dry cap on and pulled a wind jacket onto me. No mean feat cycling at twenty five miles per hour with one hand onto a car in gale force winds!! Most important of all a huge slug at the bottom of your atom bottle. An atom bottle is a disgusting mixture of glucose powder, espresso coffee and a paracetemol. It is an instant pick me up, usually taken in the last twenty minutes of a race to give you a boost of energy, improve reactions and dull the pain in your legs. It tastes disgusting but works and is one hundred per cent legal! It was just enough to get me to the finish of that day and give me the strength to hang in. When mixed with a dogged determination and the will to prove all the detractors and the “They will never do it” brigade wrong, it was a heady mixture. I collapsed off my bike in sixteenth place.